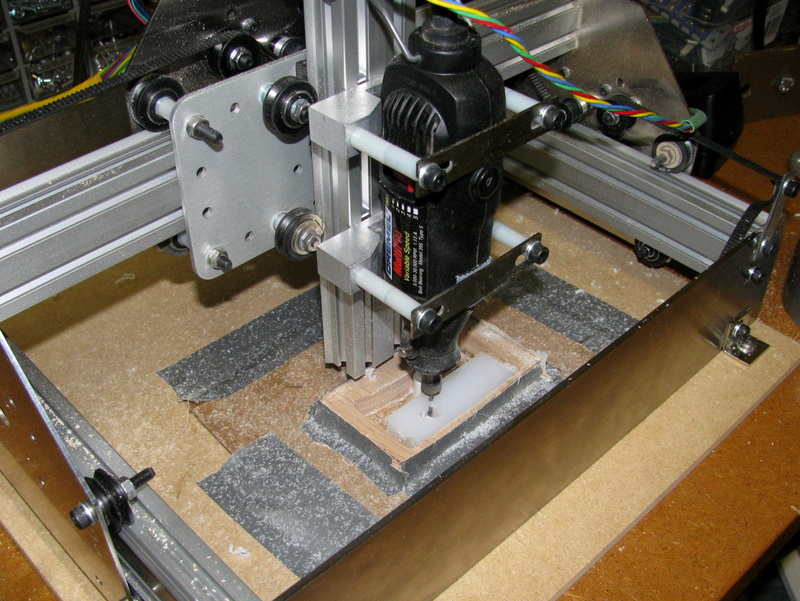 ShapeOko is an inexpensive, kit-only, computer-controlled milling machine (CNC mill). Its most distinctive feature are the MakerSlides – designed to allow very accurate and constrained X-Y motion. It uses an Arduino with a special stepper shield to control the motors. It comes in three different kits, starting with a basic mechanical kit up to a complete kit including raw materials to mill. Inventables sells the kit. Wanting a challenge, I purchased the basic kit figuring I could buy the motors and electronics as I went along. In retrospect, I should have gone with the next level up kit which included the motors as it would have simplified a number of build issues. So if you want to know what issues you may run into when you purchase a basic mechanical kit, read on. The last frame shows a rough Shapeoko logo output because the unit has not been tuned.